The fair returned to Kensington Olympia with a 50% increase in exhibitors (780 in 2014 up from 540 in 2013), from generic bodies, global brands, agents and distributors and niche wineries. New features included ‘esoterica’, for smaller, boutique importers; a dedicated section on bulk wine; as well as The Brewhouse tasting of small batch, specialist and craft beers. Visitor numbers totalled 11,247, an 11% increase on the previous year, but more importantly the key sectors of on-trade and independent retail were increased by 30% and 25% respectively, says Ross Carter, event director. Dan Jago, UK and group wine director, Tesco, applauded the changes: “I was delighted that the Fair was back at Olympia, people were much more energised about talking and selling. It felt edgy and when you looked at ‘esoterica’ and ‘Brewhouse’ it was constantly buzzing. The stands were laid out well and were working well. There was a real vibe of energy and passion for product and good old fashioned selling - literally hand to mouth - and it showed. Too many people compare this event to Prowein, but let's make this about the UK - targeting all of the markets including the independents and the on trade. Having London Wine Week following on was a great idea. For me, I had proper meetings all the way through and yet it didn't feel over corporate." Neil Anderson, marketing director, Kingsland was also pleased: "I'm over the moon that LWF is back at Olympia. The heart and soul is back into the London wine trade fair! We at Kingsland had a fantastic time meeting existing customers and meeting some new friends. It is crucial that we all continue to support a London trade fair and I look forward to seeing how we can make the fair even better next year." James Jones, wine marketing manager D&D London, John Osborne, managing director, PLB, and Jo Wehring, UK market manager Wines of South Africa, all agreed that there was a real buzz about the show this year. Nik Darlington, managing director, Red Squirrel Wine was also very happy especially with the new ‘esoterica’ area: “As one of the littler people we'd never normally have thought the London Wine Fair was our bag. But this year's esoterica was a revelation, completely exceeded our expectations and an almost unhealthy amount of fun." “For us it’s the first time we have been in the UK. We have been getting a whole spectrum of distributors, independents and on-trade – a little bit of everything. I think we are extremely happy with Brewhouse and will come back again, for sure. It really targets the people we wanted to see. 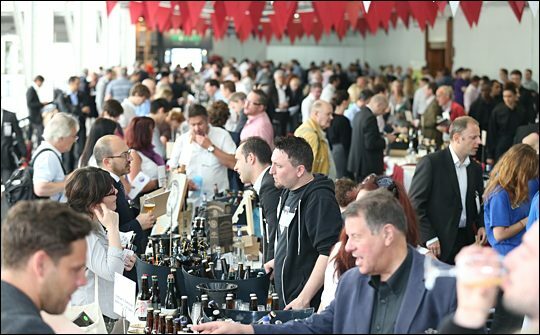 Beer at a wine show – what a brilliant idea,” says Scott Page, business development manager, Bear Brewery. “The London Wine Fair has reinvented and reinvigorated itself to brilliant effect, putting the city back at the heart of what is most exciting about the wine world," concludes Tim Atkin MW.